Dubai: The Dubai World Cup Carnival was created as a high-profile event that would lure the best international horses to Dubai and so it was on Thursday when Swedish-bred and trained I Kirk proved to be a horse with ‘star’ quality when running out a hugely impressive winner at Meydan. Sprinters tend to possess a lot of muscle that generate the power much like I Kirk demonstrated when pounding to a 3½ length victory over the much-regarded American speedball Honorable Treasure. 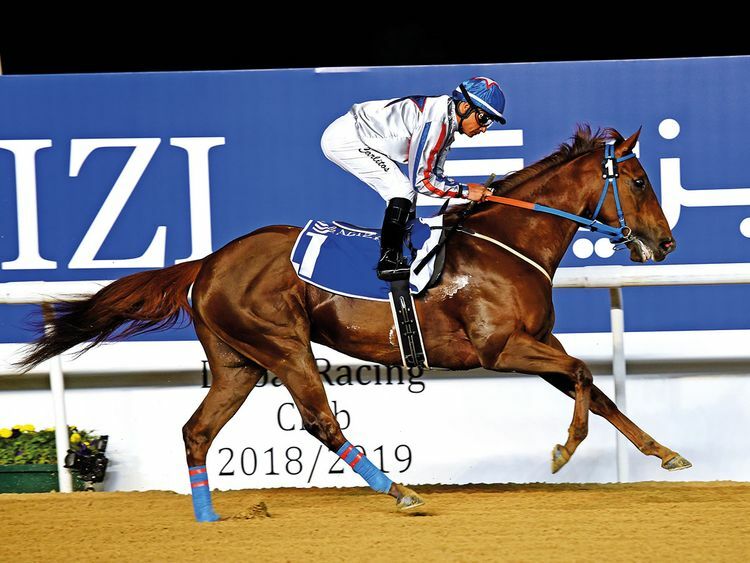 Having his first start since winning Zawawi Cup at Jagersro in July, he could not have been much more impressive, conceding weight all round, and will likely be aimed towards the Group 1 $2.5 million Dubai Golden Shaheen sponsored by Gulf News on Dubai World Cup night. Although his trainer and flat-tracing veteran, Susanne Berneklint, was not available for a comment after the race, it would be safe to say that I Kirk’s connections will definitely be looking at the $2 million Dubai Golden Shaheen, Sponsored by Gulf News, as his principal Carnival target. British bookmakers William Hill introduce him into the market for the 1,200 metre showpiece on March 31 at an attractive 14/1. The ante-post favourite is Mind Your Biscuits, who was third in the race last year behind two-time winner Roy H (5/2). “I knew he was a really nice horse, but I was a little nervous anyway,” said I Kirk’s rider Carlos Lopez. Meanwhile the all-powerful Godolphin pairing of Charlie Appleby and Saeed Bin Surour continued to seep all before them in the third week of the Carnival, with four wins from six races, including saddling the first fiver home in the concluding Azizi Mina Handicap which was won in impressive fashion by Desert Fire. The day’s showpiece race, the Group 2 Cape Verdi for fillies and mares, went to Appleby’s Poetic Charm who will now head to the Group 2 Balanchine (Thursday, February 14). “Mentally, she has done well out in Dubai. Kirsty Milczarek rides her out at home and has done a great job. “Poetic Charm is just training a lot better this winter compared to last year — she is a stronger individual and more mature. “We couldn’t have been more pleased with her coming into this race and I see no reason why she won’t see out the extra furlong of the Balanchine. Meanwhile, Meydan stage a seven-race domestic meeting sponsored by Al Naboodah Group on Saturday.